It’s the easy, no-hassle way to make sure ice is always flowing, clean and fresh. We keep your ice machine running green and energy efficient, at the lowest energy cost. That's what you get when you lease an ice machine from Creative Ice Rentals. 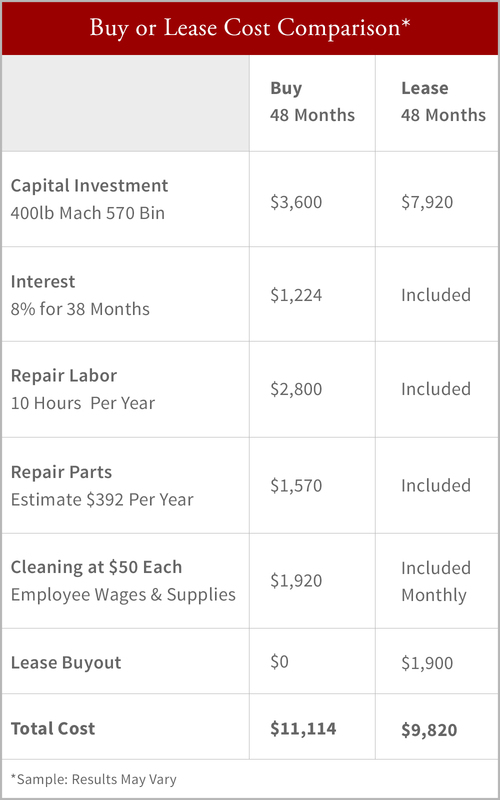 Our “Total Ice Program” includes a top-quality proper-size ice machine, regular maintenance, repair, labor and parts, routine cleaning and sanitation, and performance monitoring. When you look at lower cost, regular and reliable service, improved maintenance, and better food quality, leasing makes sense! To learn more about how we can help with cleaning and sanitizing your machine, click here. To ask us for a no-obligation recommendation, contact us today.